JooTube.TV: Who is the British Empire to cast aspersions against Israel? I agree it’s an enjoyable article, and all its criticism of London’s bureaucrats, chattering classes and the London-based media’s love of Arab propaganda is fully justified. If anything it’s too gentle, and should have clobbered most of our left-wing politicians as well. However, I think its author rather spoils things by revealing such an intense compulsion to lie in the service of his own bigotry that one might easily mistake him for an Arab himself. His many errors of fact, and they are intentional, are too numerous to refute in detail so I’ll mention just two examples. No. It was the policy of the Labour-led government in the 1930s to divest itself of the Empire. Labour was re-elected in 1945 and continued the process. “Intense prodding” by the US did occur, for example they immediately recalled vital food convoys in mid-Atlantic on VE-day, presumably to starve empire-building factory workers in the UK into returning to the UK from elsewhere in the Empire. However the prodding simply reflected an intense paranoia about the Empire among some in the US elite – the same segment that seems to have controlled the author’s schoolbooks. Balls. Odious balls, and therefore from an odious, untrustworthy author. Muslim aggression began with the first major land purchases by Zionists in the 19th century. They continued and escalated when UK received its mandate in 1922. The were renewed in 1945 the instant that the new Labour government announced its plan to create Israel. British administrators caved in and appeased the natives at every opportunity, and postponed their plans. Were these “oppressive” imperialists, as seen in American horror comics, displaying unexpected sensitivity simply so they could “break promises”? No. British administrators tried not to rile the natives anywhere, as a matter of policy, and their mandate in Palestine did not permit them to do so in any case. Nor did the British army want enthusiastic settlers creating a permanent war-zone. Who would? In the crucial UN vote that created Israel, the UK abstained. 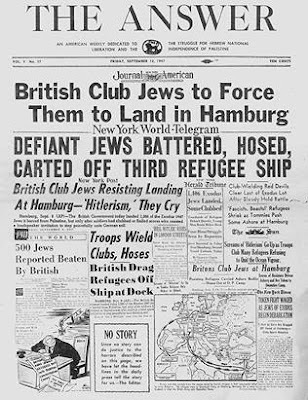 Imagine if the Jewish dream of 1900 years could be turned into a reality of continual wars and nightmarish terrorism, as predictable from nearly 70 years of local history? Would you vote in favour and hope for the best? That is how the founders gambled with Israeli lives, in perpetuity. Finally, please remember the Suez crisis of 1956. Britain and France allied with Israel but then the US smashed their alliance. The US effectively said to Israel “Thou shalt have no other gods before Me.” And here we are today.